I love cookies. I especially love Chocolate chip cookies. Chewy ones. You know how hard it is to get people who are used to crunchy cookies to make you chewy ones? It’s a religious war. Crunchy cookies are easy. You put them in the oven, you wait for the allotted time, make sure they look brown and take them out. Chewy cookies? Those are a little tougher. You have to put the cookies in, make sure they stay in just long enough to be cooked, but not long enough to be hard, and you have to take them out at the exact right moment. This is not something you do distracted. Building a blog engine is quite a bit like that. It’s easy to follow the directions everyone else has followed, it’s easier to use the platform everyone else has used, but it just isn’t as good. Notice that none of the ASP.NET blog engines are written in ASP.NET MVC. Phil Haack (the PM for ASP.NET MVC) is currently working on porting subText to MVC, but he’s the only one. There is nothing wrong with these blog engines — they’re all good blog engines. But they do too much. I’m writing this in Blog Engine.NET, but I find myself constantly working against my editor to get anything done. I’ve talked about this before. If you split the world into Microsoft stack blogs and everyone else, the Microsoft stack looks pretty bad. ASP.NET (forgive me) is not exactly ‘web 2.0’. Have you seen the junk it produces behind the scenes? And that’s just one line. It gets worse. .NET developers have to either choose ASP.NET or PHP. Crunchy cookies or Macadamia Nut Cookies? Chewy Chocolate chip? Not an option. 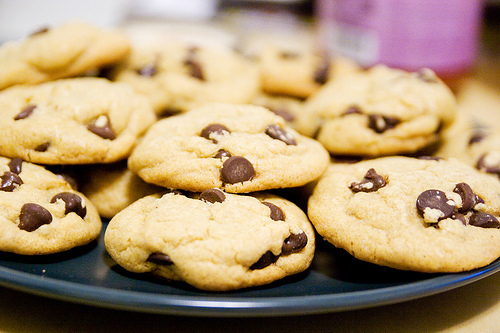 It’s time to make some chewy chocolate chip cookies.